Prepare for the inevitable. Your family will be grateful. Nothing is more important than preparing for your burial. You can ease the burden of your passing by taking a few steps so that your family can better cope in thier time of grief. Scurrying around looking through files for your DD-214 is no way to leave your next of kin. Not having a DD-214 will delay the funeral home in providing a flag for your burial. Launch theeVetRecs System to start your requestOnline. Mail or Fax your request. Burial benefits available include a gravesite in any of our 131 national cemeteries with available space, opening and closing of the grave, perpetual care, a Government headstone or marker, a burial flag, and a Presidential Memorial Certificate, at no cost to the family. Some Veterans may also be eligible for Burial Allowances . Cremated remains are buried or inurned in national cemeteries in the same manner and with the same honors as casketed remains. 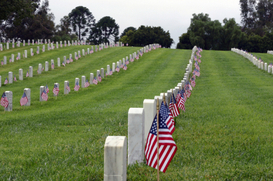 Burial benefits available for Veterans buried in a private cemetery include a Government headstone or marker, a burial flag, and a Presidential Memorial Certificate, at no cost to the family. Some Veterans may also be eligible for Burial Allowances . There are not any benefits available to spouses and dependents buried in a private cemetery. *Note: Link will take you outside the VA web site.